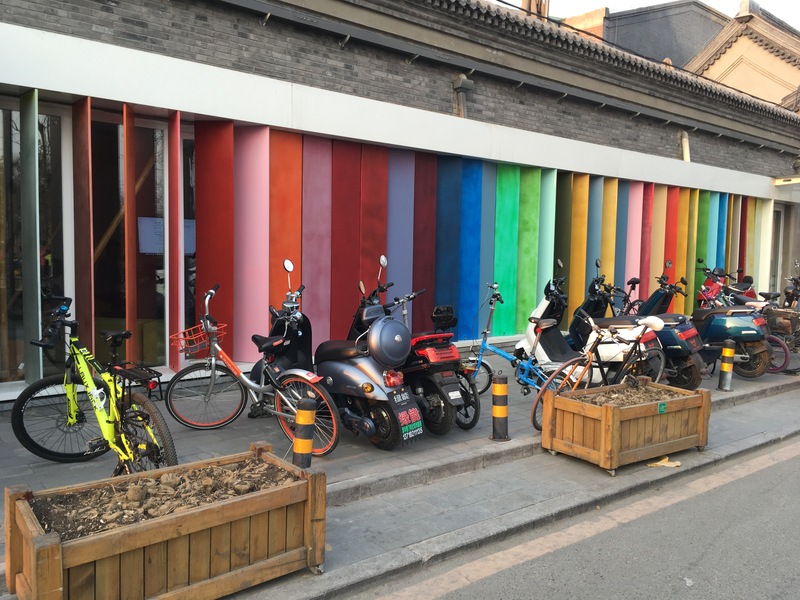 After a fairly quiet day, I spent the evening on an Urban Adventures tour for Beijing Street Food. 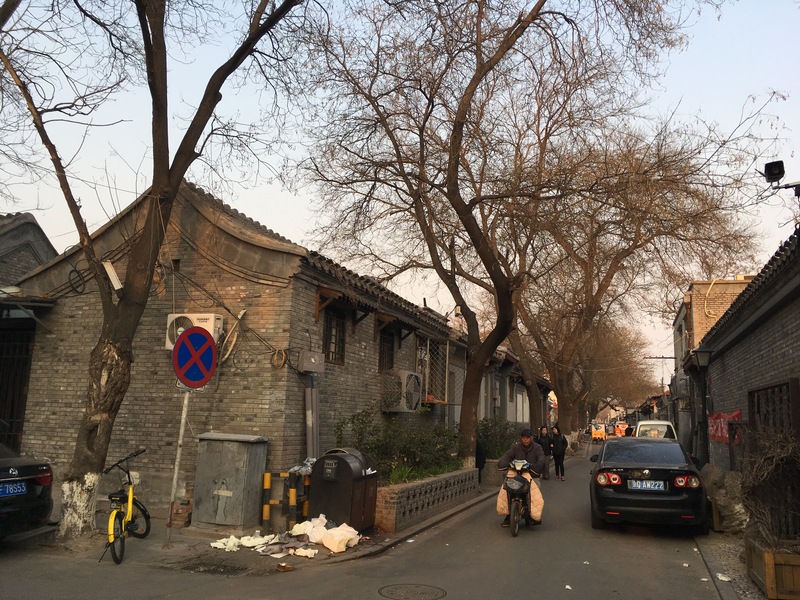 I waited for our guide Lily and the rest of the group (only three more people; Belinda, Arv and Chantal) outside Exit E of the Gulou Dajie metro station. After brief introductions of names, countries of origin and occupations, we walked to the first stop on our foodie tour. Disclaimer: I cannot, for the life of me, tell you what each place was called or even what every single dish was called. I can only describe it to you and share my thoughts. If anyone can fill in the missing information, please feel free! First stop! This ended up being much more exciting for me than expected. 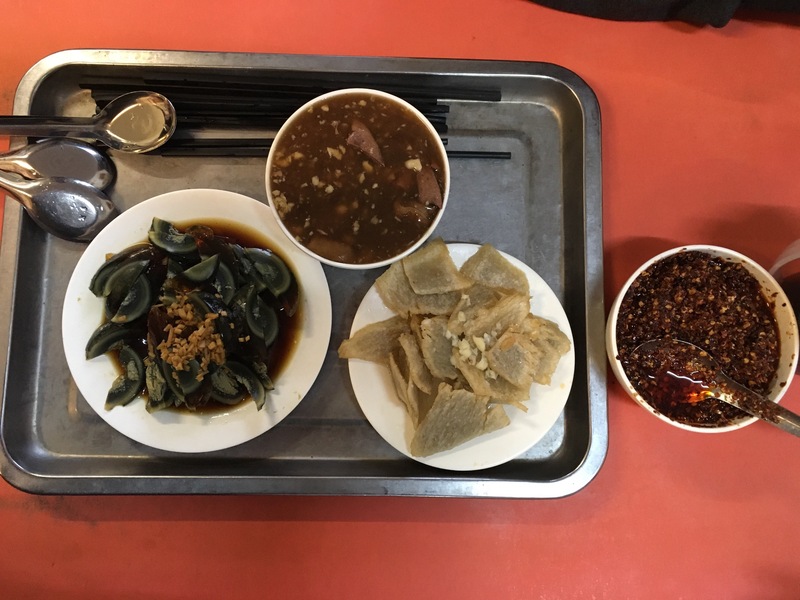 My older sister Anna, who lived in China for a few months as part of her university degree, had described a Chinese dish to me and told me over and over to make sure I try it. 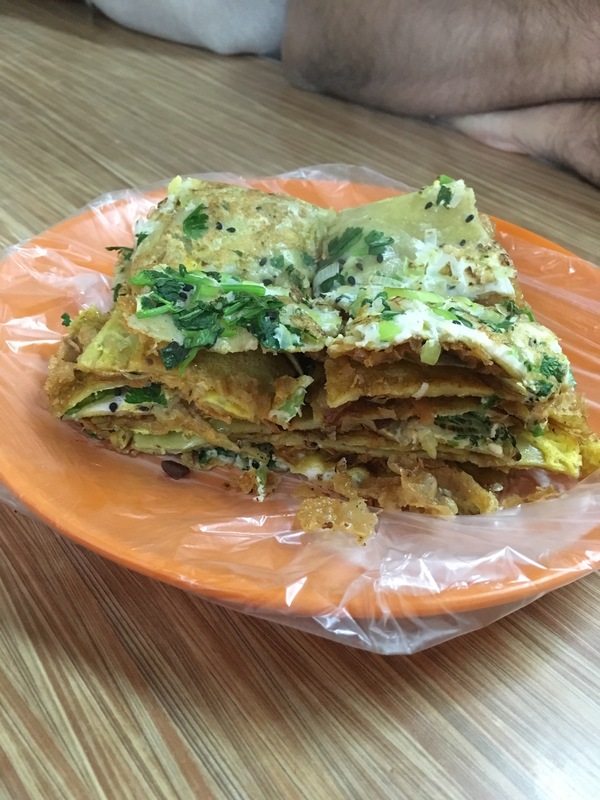 Well, luck would have it that the very first treat on our tour was just that; jian bing. 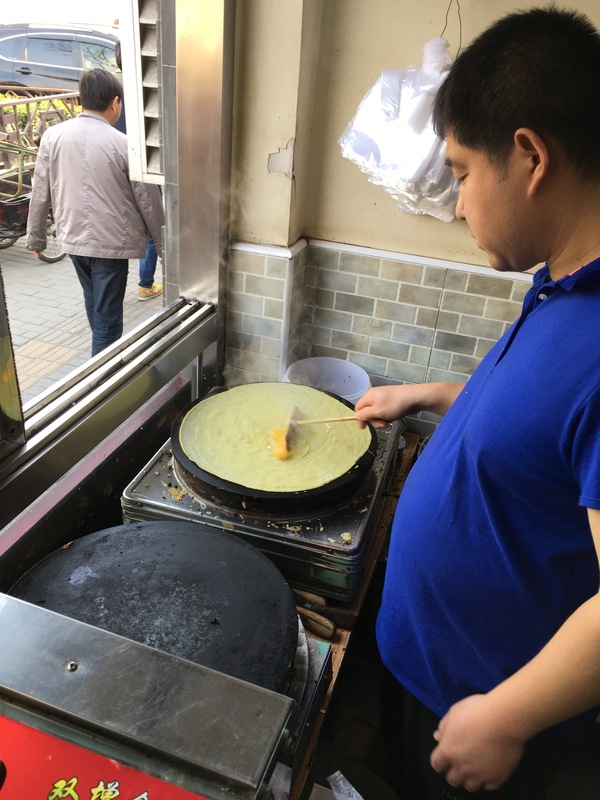 Made fresh right before our eyes, Jian Bing is a crepe topped with an egg that it spread around the surface of the crepe, some sort of bean paste I believe, green onion, and a crispy piece of fried…dough? Fried something. I’m sure you can request different toppings and filling, but Lily was doing that for us, thankfully. The crepe, along with all the toppings, is then wrapped around the fried something, folded and cut into pieces (one extra cut for us because we’re sharing). We all thoroughly enjoyed our jian bing, to which we added a bit of chili oil on our own. I can’t wait to have it again! Jian bing, two thumbs up! 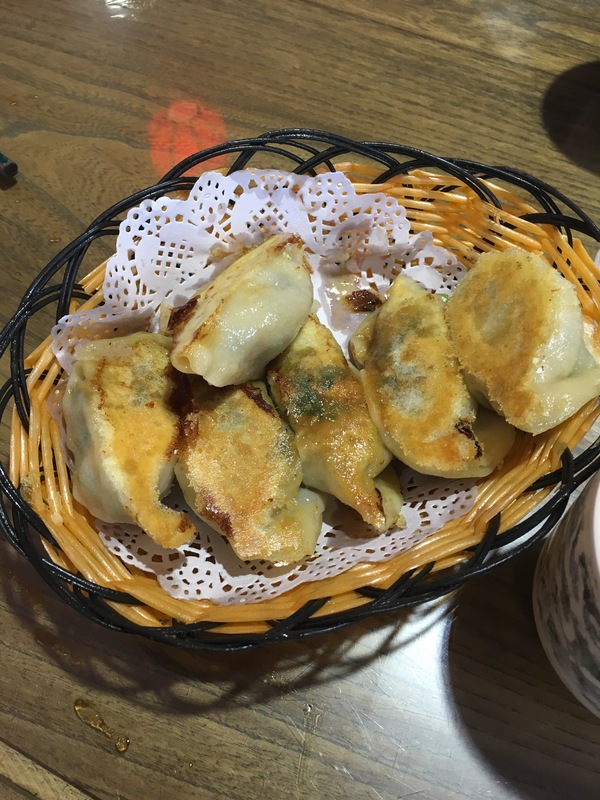 Stop number two – dumplings! You know we had to try some dumplings. Lily ordered Specialty Dumplings (fried) for the group and then we all decided on an order of Pork and Fennel dumplings (boiled) as well. Again, Lily was right! Both were excellent, but the fried specialty dumpings were far better. Stuffed with shrimp, pork and some vegetables, we topped our own pieces with green garlic vinegar and chili oil. Scrumptious!! The pork and fennel were great as well and I would definitely order a second time. I think the vinegar with green garlic really takes the dumpling experience to the next level. And of course, chili oil on everything doesn’t hurt either. We also “enjoyed” dessert at this stop. Lily had told us that the Chinese don’t usually like dessert and I think I know why. Alright, so maybe dessert isn’t their forte but they have perfected so much else in the culinary world. I can forgive them for the lack of dessert expertise. Basically, we tried two things that tasted like nothing. 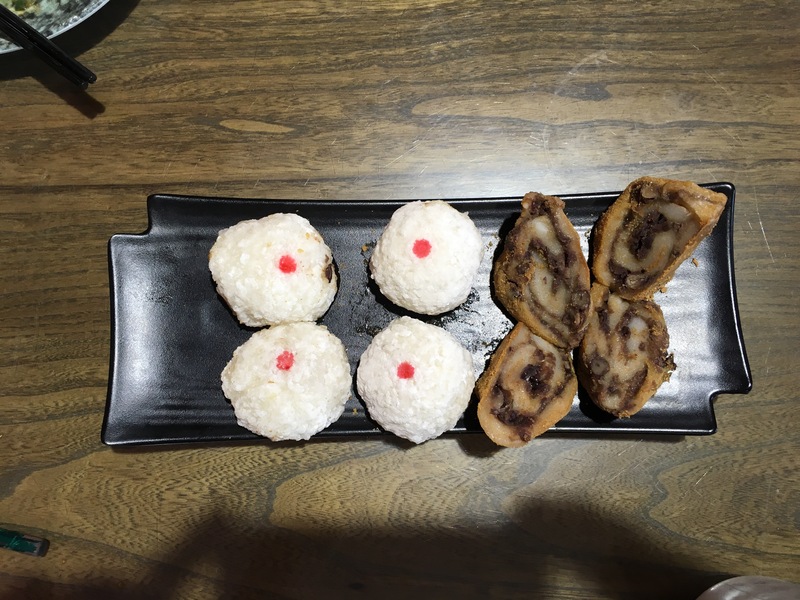 Except one of the things (the white ball of sticky rice in the photo below) was filled with sugary syrup. That’s about it. There was a lot of chewing involved, which made the experience even less appealing. The goal was to try new foods and that’s exactly what I did. I tried everything. Dessert. Looks can be deceiving. 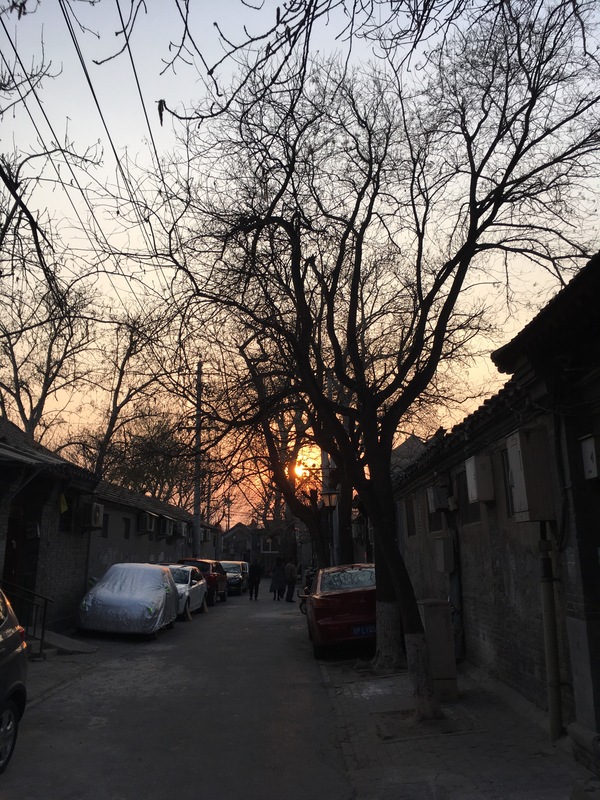 The sun slowly began to set as we walked through small side streets flanked by the Hutongs, working off the jian bing and the dumplings. Lily bought each of us a yogurt drink along the way. For some reason it was difficult to find a refrigerated one, but we eventually did and it was quite tasty! Sweetened with honey, Arv compared the yogurt to an Indian Lassi. Not far off actually, a good comparison. Our last stop was packed with locals lined-up to the door for a bite to eat. We found a table and good ol’ Lily went back to order us some food. We are at the mercy of Lily this evening, but that’s what it’s about; getting out of our comfort zones and trying foods we wouldn’t normally glance at. 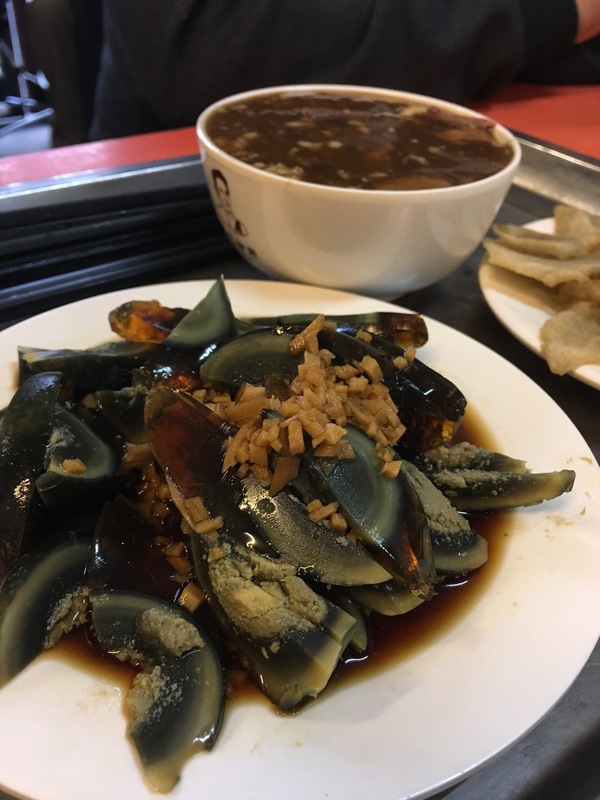 You shoukd know that earlier in the evening, Arv made the mistake of asking about a century egg and where he could get one. Lily accepted the challenge and now, at the last stop of the night, we sat there looking at slices of a very interesting egg. The egg whites were…no longer white, but more of a translucent brown. You know the coating that comes on pâté when you buy it from the store? It was that colour. The yolk, on the other hand, actually looked quite beautiful. It reminded me of a geode with its gradation of black, grey and yellow colours. Lily did her best to explain each dish to us, amidst a barrage of questions. So this egg is a thousand year, century egg that was made a week ago. Figure that one out. It didn’t taste as awful as we had anticipated. Belinda and I definitely psyched ourselves out way too much before trying the egg. I actually ended up having three or four slices. Also on our plate was a fried treat made of green bean powder and served in vinegar. Of course we added chili oil and quite enjoyed that dish. As well, we were served a soup that…received less attention than even the egg. The broth was so thick I don’t even know if I can comfortably classify it as broth. It’s thickened with starch, giving it a gelatinous texture and the viscosity of glue. And that’s just the base! Lots of garlic and pork parts swam inside the brown glue. We all tried it, but it was neglected afterwards. There is no guarantee that everything on a food tour will be to your liking. The egg. The soup. The tasty fried bean powder. And of course, chili! 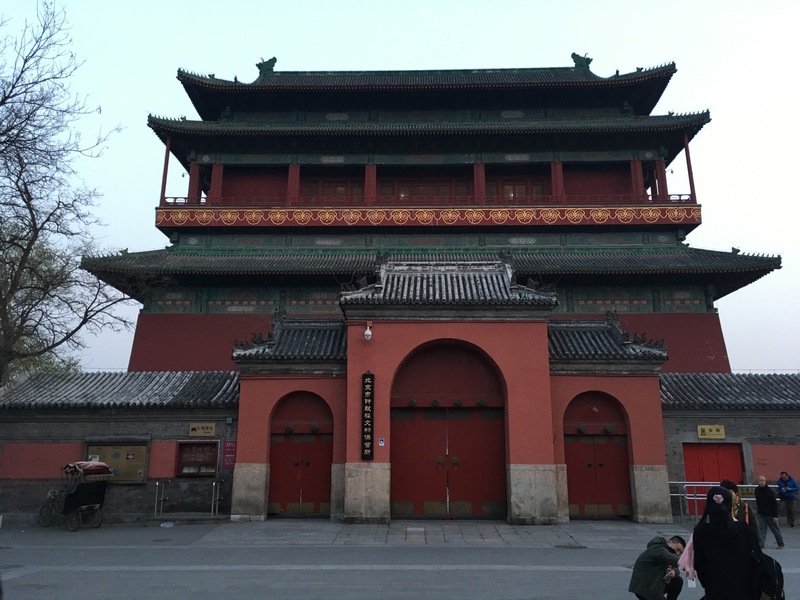 We then walked to the courtyard between the Drum Tower and the Bell Tower, snapped a few group photos and shared our gratitude with Lily. She showed Arv and Belinda to the metro station, then Chantal and I hopped on the number 60 bus with her for a few stops. All in all, a fantastic evening with a wonderful group of people. Bell Tower selfie! 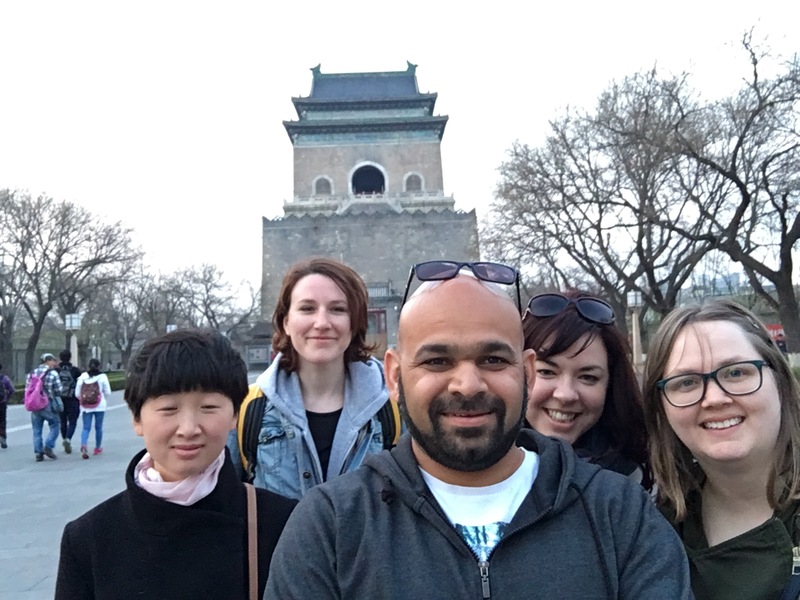 Left to right: Lily (our guide), Chantal, Arv, Belinda and me!